I watched this red rice, Adamant creeper dosa recipe (Sigappu arisi pirandai dosai in Tamil) in Jaya TV’s arusuvai neram by Mrs. Mallika Badrinath. She shared this healthy sivappu arisi dosai adding pirandai. Recently my MIL had given some pirandai ( also known as bonesetter) from our backyard garden to make thuvaiyal. As I had some red rice and pirandai in stock, I tried this dosa immediately. Addition of pirandai helps to give more softness to the dosa. So I changed the ratio of red rice & urad dal as per my taste. It came out very well. We had a satisfaction of including a healthy food for our breakfast and dinner. I had already shared Kerala red rice idli, dosa recipe in my website. 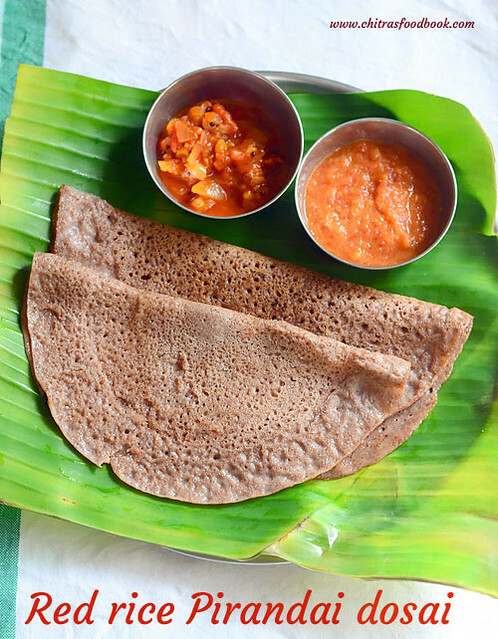 This red rice dosa is completely different from that recipe on ingredients and method.I have also shared the picture of red rice used in this recipe. 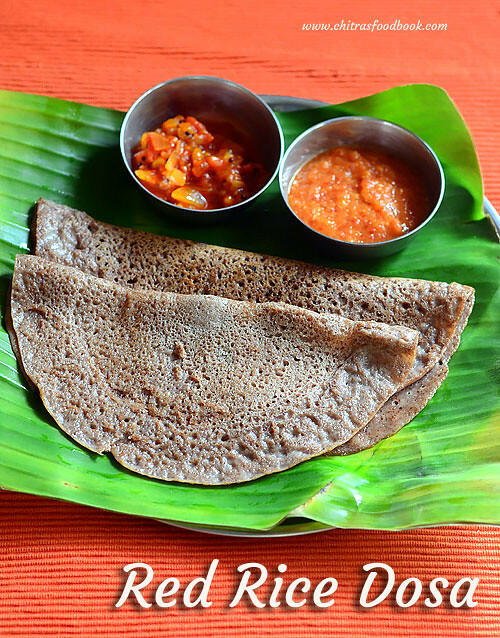 Ok, lets see how to make red rice dosa recipe / Sigappu arisi dosai adding pirandai with step by step pictures. Also check out my PIRANDAI THUVAIYAL, KERALA RED RICE IDLI/DOSA RECIPE and 15 IDLI VARIETIES ! Wash and soak red rice, urad dal and methi seeds together for 5 hours. Wash and clean pirandai. Chop into pieces and grind to coarse paste. Grind rice, dal mixture along with pirandai adding salt and water. Ferment overnight or for 12 hours. The next day, mix dosa batter well. Add some water if needed. Make dosa thin or thick. Serve with chutney or sambar ! Wash and soak red rice, urad dal, methi seeds together in enough water for 5 hours. Take the pirandai and clean it. Grease your hands with sesame oil. Wash the pirandai and chop the head & tail part. Remove the ridge like part using a peeler or knife. Remove the fiber portion too. Chop into small pieces and set aside. Grind pirandai pieces to a coarse paste without water. Add this paste to rice while grinding. Grind the soaked rice + urad dal + methi seeds adding pirandai paste to a smooth batter adding enough water and salt. Collect in a bowl. Ferment overnight or for 12 hours. Heat dosa tawa and sprinkle some water to check the heat of tawa. Water droplets should evaporate immediately. Wipe with a cloth or tissue. Spread 1.5 ladle of red rice dosa batter thin or thick as you like. Drizzle 1tsp sesame oil all over the dosa. Flip the dosa and cook the other side. Remove and serve hot with chutney or sambar. Enjoy ! If you don’t have adamant creeper/pirandai in hand, you can use red rice & urad dal in 4:1 ratio. Fermentation is mandatory for this dosa batter else it will smell raw. Do not worry if the batter is not raised well. Just check whether batter has got sour smell / Pulippu vasanai the next day morning. You can increase the quantity of urad dal to 1/2 cup +2 tbsp to get softer dosa. 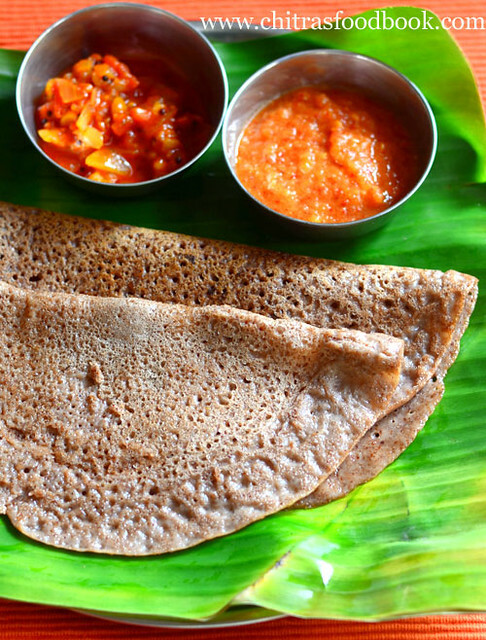 Try & enjoy this healthy red rice dosa with pirandai. I served it with easy tomato thokku and raw onion chutney !